Name the last governor who was a former mayor of Charlotte. Can't think of one? Well, that's because former Charlotte mayors don't do too well in statewide races. Richard Vinroot, for example, lost his bid for governor to Michael Easley. Still, this isn't stopping current Charlotte mayor Pat McCrory from putting his hat in the gubernatorial race. The current mayor says that he doesn't put any stock in the fact that Charlotte mayors haven't faired well in statewide elections. "I think it's a pundit's story rather than a story coming from regular, everyday citizens," he says. McCrory adds that no one says that people from the coast should avoid running for statewide office just because Pat Ballentine, a Wilmington politician, lost his bid for governor. "I don't think it has anything to do with being the mayor of Charlotte," he says. "I think it has to do with the timing, possibly the candidate, the method that they convey their views." McCrory believes his run for governor will help Charlotte, even if a win means the city loses the only mayor that many of its newer residents have ever known. "I think running for governor actually helps Charlotte in the long run because it brings attention at the state level to many of the issues that Charlotte has been dealing with for the past decade or two," says McCrory. Still, McCrory knows that he's going to need more than just support in Charlotte to get a seat at the head table in Raleigh. That's why he says he announced his run in Jamestown, the sleepy Guilford County town between Greensboro and High Point. He says many people didn't know he grew up there and by the Triad being in the middle of the state, "it was a way of broadening my background to constituents not only in Charlotte, but throughout the rest of the state." 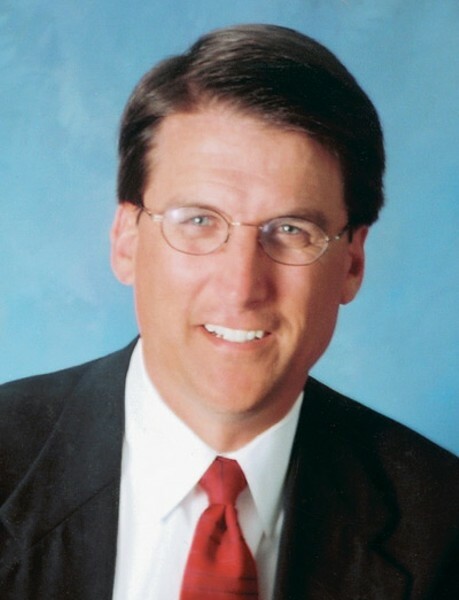 McCrory, who says he loves the Queen City, will set up his campaign headquarters in Charlotte. After his announcement, McCrory told a reporter that he and his wife, Ann, plan to make Charlotte their permanent home.